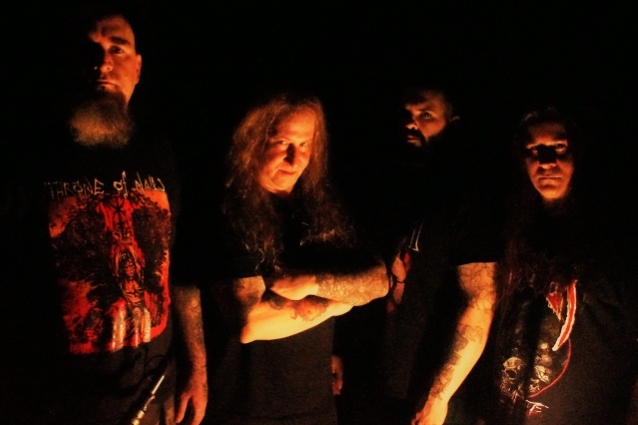 The music video for "Release The Soul", a brand new song from Florida death metal veterans MALEVOLENT CREATION, can be seen below. The track is taken from the band's latest album, "The 13th Beast", which was released on January 18 via Century Media. "The 13th Beast" introduces a new lineup consisting of Phil Cancilla (drums), Josh Gibbs (bass), Phil Fasciana (guitar) and vocalist/guitarist Lee Wollenschlaeger (THRONE OF NAILS, IMPERIAL EMPIRE). "No one can destroy this MALEVOLENT CREATION" is a legendary line by the late, great Bret Hoffmann, who passed away on July 7, 2018. Renowned and revered for his vicious vocal style and unique onstage presence, Hoffmann is impossible to replace, but co-founder Phil Fasciana decided to face the challenge and affirm the truth behind this lyric from the group's 1991 debut "The Ten Commandments". "This is the biggest honor I could ever be given," says Lee. "The opportunity to front one of my all-time favorite bands, and an even bigger pleasure of jamming with such great people. "We have created one of the most relentless albums of MALEVOLENT CREATION's history. As a fan, I know we are going to shock a lot of people at how intense this new album is. Done in a way only MALEVOLENT CREATION can. "I can't wait to see all you guys on the road in 2019 and beyond, playing songs from all the albums, including our new album, 'The 13th Beast'!" "Lee was the missing link when I was searching for a new vocalist and guitarist," adds Fasciana. "Each new member is a solid musician and songwriter sharing the same passion for extreme music MALEVOLENT CREATION has been striving for since 1987. "I'm very proud of this album and look forward to present it live as well as songs from our massive back catalog, including stuff that hasn't been played live in a long time or ever." Musically, "The 13th Beast" expands upon 2014's "Dead Man's Path" yet also incorporates a brutality known from albums such as "The Will To Kill" and "Eternal", which is further accentuated by Wollenschlaeger's understandable-yet-deeper vocal tone and songwriting contributions. Just like "Dead Man's Path", the record offers artwork by German Latorres, and was mixed and mastered by Dan Swanö at Unisound. "The 13th Beast" was released as black and limited colored LP plus four-page LP booklet, CD, and digital album.